JNTUK Transfer of students from One College to another College within the same University for the Academic year 2017-18. 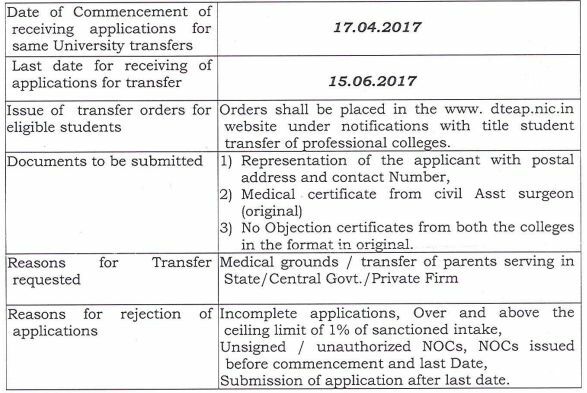 Download no objection certificate (Format of NOC to be issued by the Principals of Colleges in respect of students seeking transfer for the academic year 2017-18). Sub: TECHNICAL EDUCATION – Transfer of students from one Engineering/ Architecture/ MBA/ MCA Professional Institution to another Professional Institution for the academic year 2017-18 – Reg. Ref: 1. G.O.Ms No.122, Higher Education (EC.2) Dept, dated 01.09.2005. 4. This office letter of even no dated: 23.04.2016. With reference to the Student’s transfers from one Engineering/Pharmacy/ Architecture/ MBA/ MCA College to another college within the same University for the academic year 2017-18, the Registrars of the Universities are requested to communicate and instruct the principals of their affiliated professional Institutions to follow the schedule scrupulously. The Registrars of the affiliating Universities are requested to instruct the Principals of their affiliated colleges to guide the students-in terms of GO ref 1st cited and also not to issue NOCs after the cutoff dates to the students seeking transfers from one college to another college. Further, the Registrars of the affiliating Universities are also requested to instruct the Principals of their affiliated colleges to effect the transfers of students only after receiving the transfer orders from the competent authority as the aspirant students are facing much hardships by shifting themselves to the new colleges without Government Orders. I want to tranfer from jntua to jntuh…is it possible to do do? I am meghamala i am lateral entry i am comlpleted 2 nd year i want to transfer to another collage, so please help me the process for transfer nd please tell the dates for transfer. yet, had you any order from higher education ? Sir,I am Surya I am also studying btech 1st year want to transfer the college for 2nd year if I get transfer can I get fee reimbursement pls tell me sir…..
Wr did u complete ur 1 st yr btech? Sir I have completed 2-1 and I want to transfer to another college and they r asking remaining years fee sir .. plz say me how do ..
can we transfer after completing 3-1 semester….? Sir I am studying btech first year I want to transfer…..tell me what the process…. Sir I m now study in 2year.I can transfer from other same jntuk applicated college.it is possible or not sir. So please understand my problem sir. Hlooo …I’m also having same doubt….plzzz answer this…. I’m also studying btech . U told that ur college demanding that u have to pay remaining years fees. But brother don’t worry recently our government passed the rule.if a student want to transfer from one college to another no need to pay remaining fees.